DaintyBaby.com recently started carrying a new item called Breathable Bumper by BreathableBaby. They make a couple of products but their main one, and the one they are best know for is their Breathable Bumper. When my DS was in a portable crib in my room, I often found him sleeping with his feet sticking out of the slats and sometimes he would wake up crying when he got stuck in them. A friend of mine has the same crib but never had that problem because she has a crib bumper around her crib which protects the baby from banging their head, arms, legs against the wood. I never felt comfortable with a crib bumper being that it increases the risk of SIDS and goes against the advice of my pediatrician, so I just left the crib bare and exposed DS to the wood! I figured he is still better off that way. I no longer have to make the choice anymore between crib bumper vs. bare, hard wood. 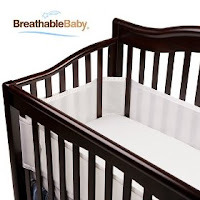 BreathableBaby came up with the amazing idea of making a crib bumper that cushions the wood and keeps little limbs in, but is also breathable and safe-hence the name. Basically it is the same shape as a standard crib bumper, however instead of being made from puffy batting and fabric it is made from a mesh-like material that promotes air flow and helps maintain air access. It is slightly padded so it is cushiony but not padded enough that toddlers can use it as a step ladder. It comes in alot of colors, fits most cribs and is washable!! All in all, it is a great product and really brings the best of both worlds together.